Although I love Disney, it doesn’t have a stranglehold on my interests. My attention turns to anything interesting and especially vintage! The Shadow is a vigilante crimefighter and one of the most famous adventure heroes of the twentieth century. He has been featured on the radio, in a long-running pulp magazine series, in comic books, comic strips, television, serials, video games, and at least five films. The character debuted on July 31, 1930, as the mysterious narrator of the Street and Smith radio program Detective Story Hour developed in an effort to boost sales of Detective Story Magazine. Later a magazine based around The Shadow was created. The first issue of The Shadow Magazine went on sale on April 1, 1931. On September 26, 1937, The Shadow radio drama, a new radio series based on the character, debuted. And the rest is history! Many may not know that Welles got his start in radio. He did a little show with The Mercury Theatre on the Air called War of the Worlds (October 30, 1938) which threw a whole nation into panic and chaos. But it certainly got Welles some attention! 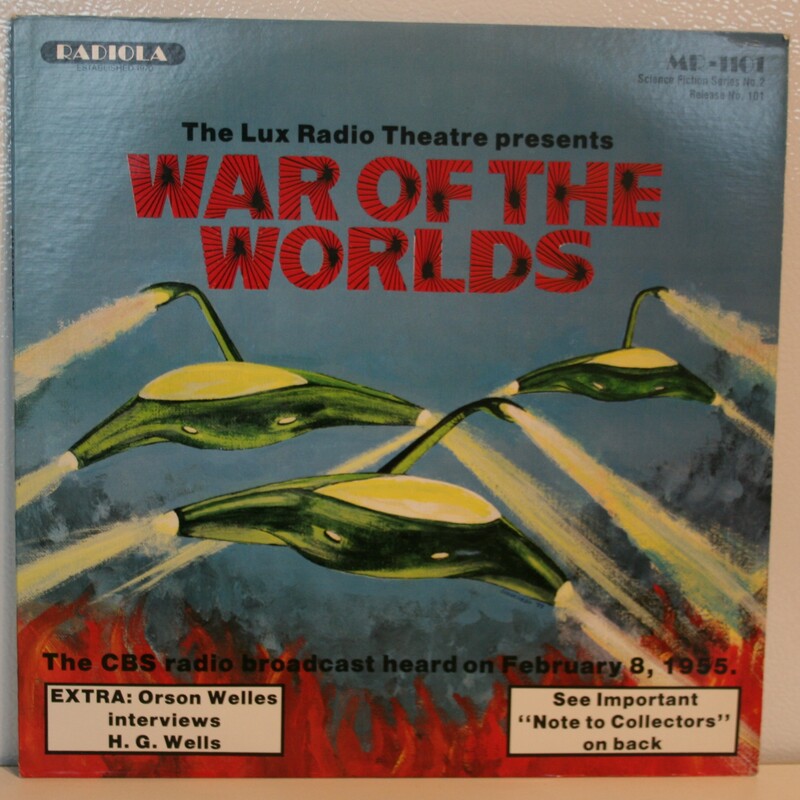 The copy of War of the Worlds that I have is not the original broadcast, but a reproduction of the play by The Lux Radio Theatre done on February 8, 1955. The Green Hornet visits Germany? A masked crime-fighter created 1936 who first appeared on radio. The character appeared in film serials in the 1940s, a network television program in the 1960s (co-starring Bruce Lee as Kato), multiple comic book series from the 1940s on, and a feature film in 2011. 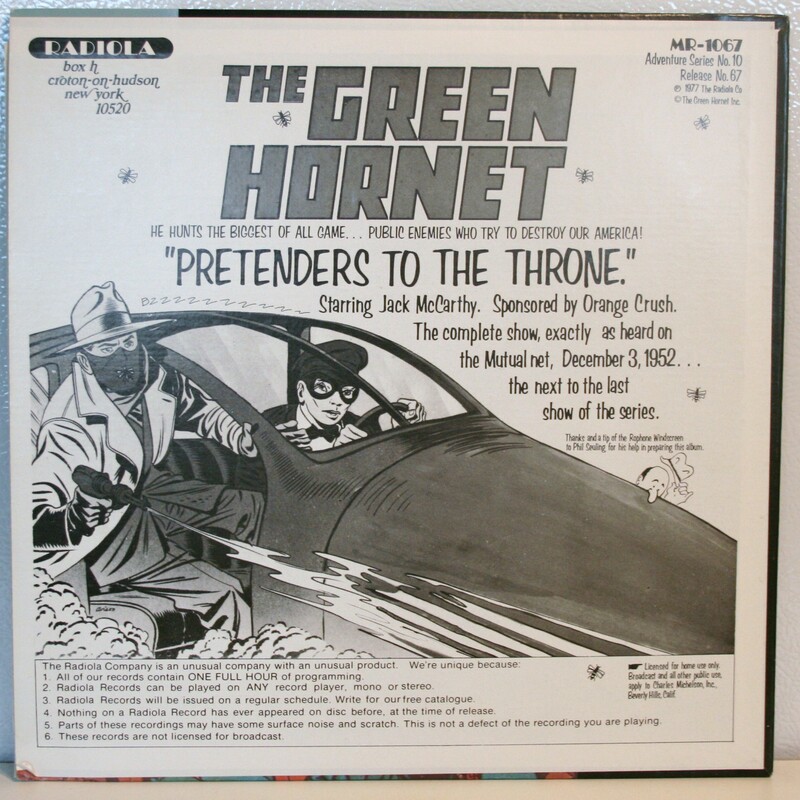 The Green Hornet is the alter ego of Britt Reid, wealthy young publisher of the Daily Sentinel newspaper. By night Reid dons a long green overcoat, green fedora hat and green mask to fight crime as a vigilante. He is accompanied by Kato who drives their technologically advanced car, the “Black Beauty”. The twist for this character is that he is believed to be a criminal, a cover he uses to infiltrate the underworld and foil their plans. 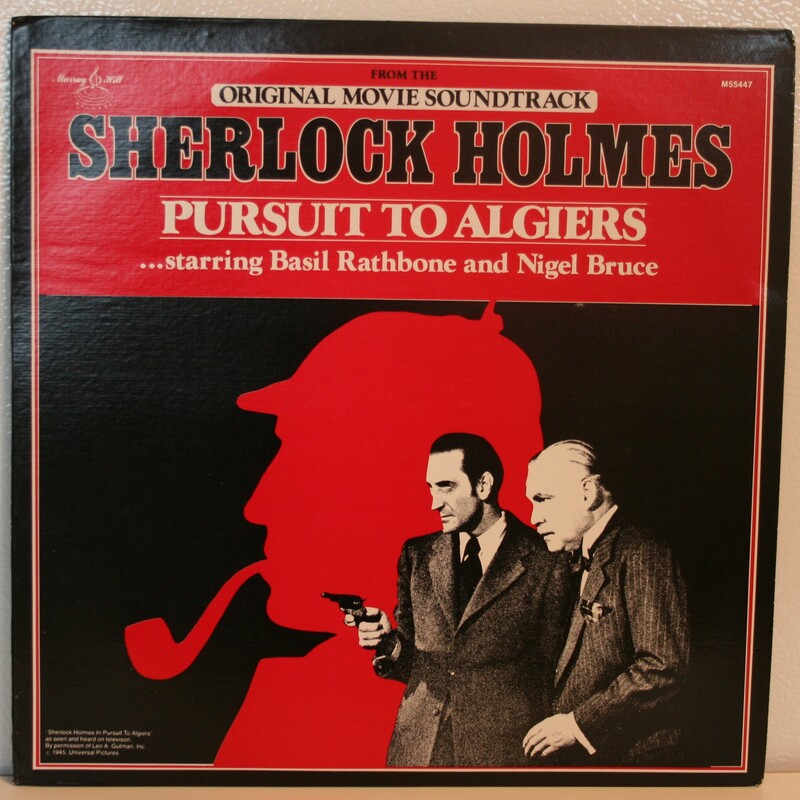 Basil Rathbone played Holmes and Nigel Bruce played Watson in fourteen U.S. films from 1939 to 1946, and in The New Adventures of Sherlock Holmes on the Mutual radio network from 1939 to 1946. The top LP features two half-hour episodes from the radio New Adventures series and features some nice, if simplified, artwork on the cover. For many of these old LPs it is the covers that draw in the collectors! 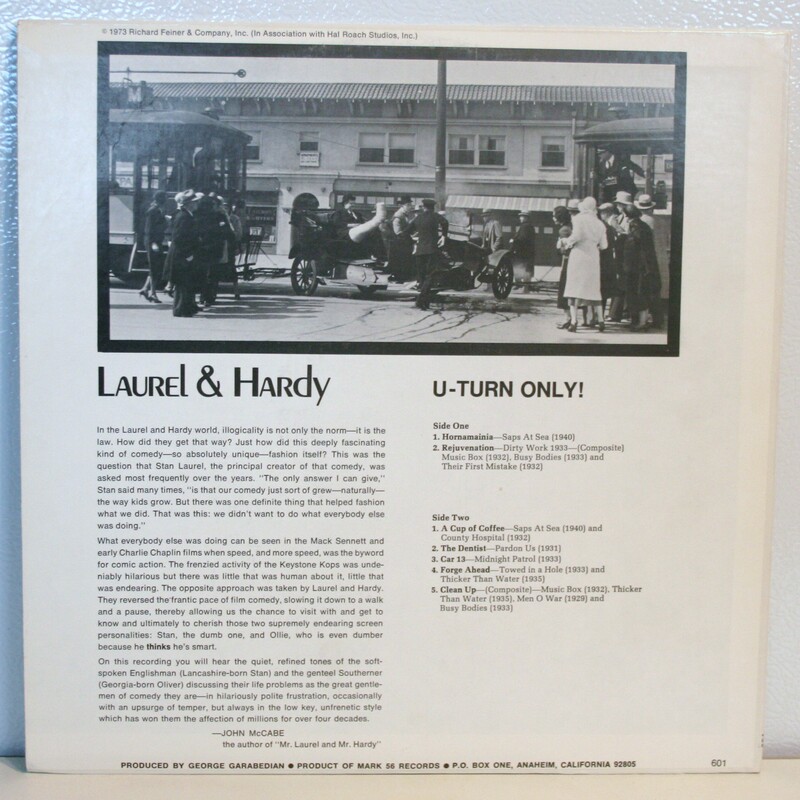 The bottom two LPs feature a more generic cover with only the text changing. Not as interesting for collectors, but easier to produce for the art department! 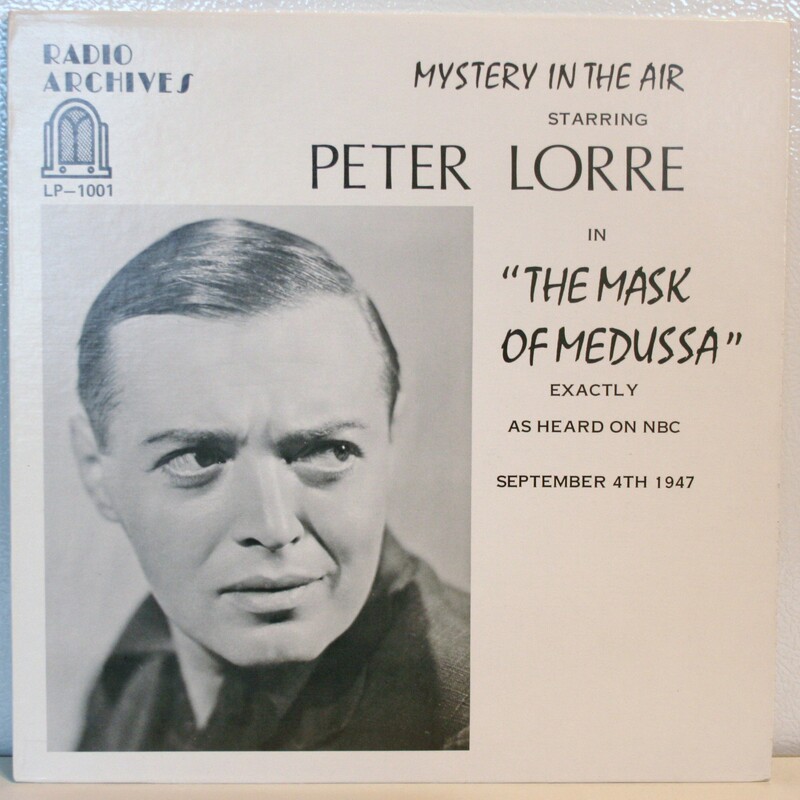 Many A-list actors and actresses took a turn at radio in the early days, some even lending their names to the programs, such as Mystery in the Air with Peter Lorre. The Fat Man was popular during the 1940s and early 1950s. The detective started out anonymous but rapidly acquired the name ‘Brad Runyon’. Broadcast from the studios of WJZ in Newark, New Jersey, the series premiered on the ABC Radio Network on Monday, January 21, 1946, and ran until 1951. In that year, 1951, it was finally made into a movie for the silver screen. 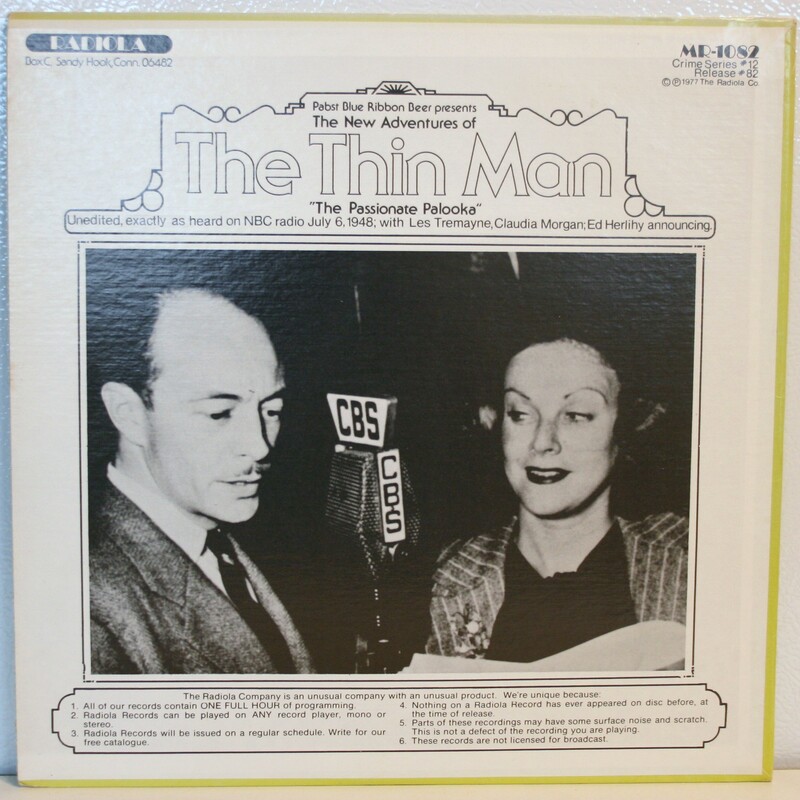 The first Thin Man movie was released in 1934 and spawned many successful sequels. The movies were popular because of the volatile relationship between the main leads. It was a natural to recreate this chemistry on radio! OK, let’s lighten up things a bit! My favorite comedy duo of all time! From silent films to talkies, these two comedians had no equal. Their low-key approach stood in stark contrast to the frantic antics of other popular acts of the day which only served to endear them to fans and critics alike! This LP features some skits taken from movies and short subjects filmed between 1929 and 1940. Think of it as more of a comedy album than a soundtrack.